Aleppo Pine Blight | Artistic Arborist, Inc. Aleppo Pine Blight – Artistic Arborist, Inc. Written by admin on June 11th, 2015 June 11th, 2015 . Aleppo Pine blight, which has no known biological cause, is particularly severe this year. 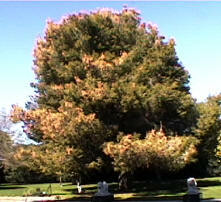 Tree owners noticed problems with their Aleppo pines beginning about Thanksgiving, 2002. By January 2003, the problem became severe. It is especially prevalent on old, established trees with high value. Young trees appear to be resistant to it. It also appears occasionally on Elderica Pines and Canary Island Pines, but the problem is most prevalent on the Aleppo Pines. Why? No one knows. So what could the cause be? Discussions with Dr. Jean Stutz at Arizona State University and Ron Ykema of the State Agriculture Lab have offered a number of possible “new” biological agents. Could it be Xylella the bacteria-like organism that is responsible for Ash decline and Pierce’s disease in grapes? This organism is widespread in ornamental plants and there are hundreds of known symptom-less species. However, no conifers have been listed as carriers of Xylella. Another suspect is Cylindrocaron which people at BBI Labs have isolated from the roots of some affected trees. Are these specimens deficient in some type of mycorrhizal fungus that leads to the plugging of xylem vessels that lead to blighted stems? Who knows. Other possible culprits are mites. We have noted that the needles of affected trees that begin to decline show small chlorotic spots that resemble mite damage and we have seen mites crawling on our specimens when we examined them under the microscope. No webbing is present and mites are certainly known to be pests of other conifers. So what causes Aleppo Pine blight? We at Artistic Arborist are now embarking on controlled, experimental studies to see if there is a way to overcome this problem.